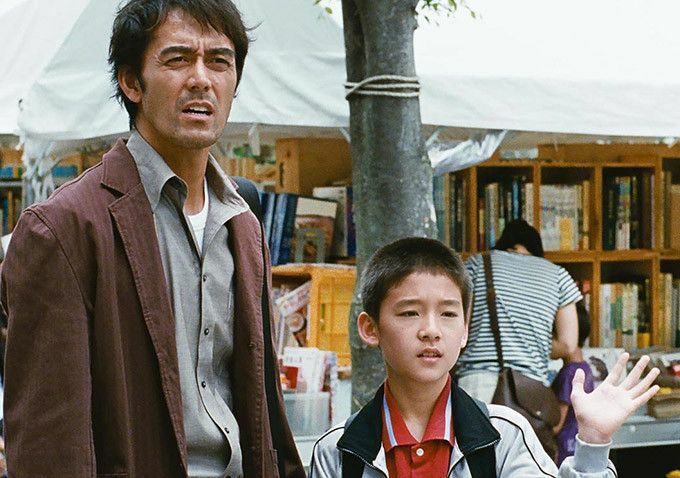 After the Storm (Umi yori mo Mada Fukaku, 2016), a domestic drama written and directed by Hirokazu Koreeda, is another one of the director’s leisurely examinations of an ordinary (sort of) Japanese family. In this case the focus of attention is on a fortyish man struggling to hold together his life despite its long, slow downhill slide. The man in question, Ryota Shinoda (played by Koreeda favorite Hiroshi Abe), had won a prestigious literary prize with the publication of his debut novel, but that was fifteen years ago. Since then, Ryota has not written anything and is now impoverished, although he claims to be researching material for his next novel by working as a part-time detective. At some point during this long downslide and before the start of the film, Ryota’s attractive wife, Kyoko Shiraishi (Yoko Maki), apparently got fed up with his irresponsible time-wasting and obtained a divorce. Now his only brief contact with her is when exercising his once-a-month visiting rights to see their 11-year-old son, Shingo (Taiyô Yoshizawa). Since the focalization is mostly on Ryota, we see things from his perspective, which involves problems along four dimensions: writer’s block, lack of money, family breakup, and loss of respect. At the root of these problems and a significant exacerbating factor, is Ryota’s serious gambling addiction, a trait he seems to have learned or inherited from his recently deceased father. Whenever Ryota does earn a little money, he immediately blows it all away via gambling losses at the bicycle racetrack. He is three months behind on his alimony payments and seems to have failed to pay back loans he received from all his friends and relatives. Nevertheless, Ryota is presented as a nice guy. Though perpetually somewhat disheveled, he is tall, good-looking, and amiable. He looks eminently employable. First impressions are that he seems to deserve better. But gradually we are exposed to his relentlessly self-centered and irresponsible nature. His sister (Satomi Kobayashi) is fed up with his failure to pay her back the money that she loans him. 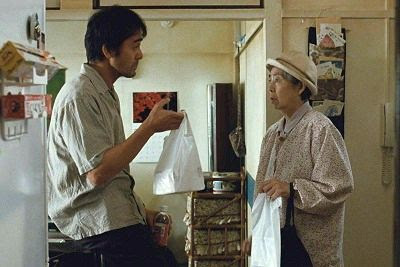 When he goes to visit his mother’s, Yoshiko Shinoda (Kirin Kiki), fourth-floor walk-up condo to pay her a visit after his father’s death, his main goal appears not to be consoling his mother about his father, but searching the condo for things that he can steal and take to the pawnbroker. He even surreptitiously pilfers some unused lottery tickets while he is there. Ryota’s job as a private detective turns out not to be as glamourous as one might expect from reading detective fiction. 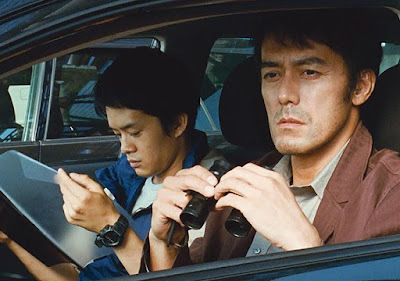 Ryota’s work is mainly spent surveilling and spying on suspected adulterous spouses. Ryota’s lackadaisical sense of morality manifests itself here, too, when he covertly tells one unfaithful woman that if she pays him enough money, he will write up a false report and affirm her fidelity to his client. Thus Ryota is quite willing to use blackmail and double-cross his employer in order to fatten his wallet. 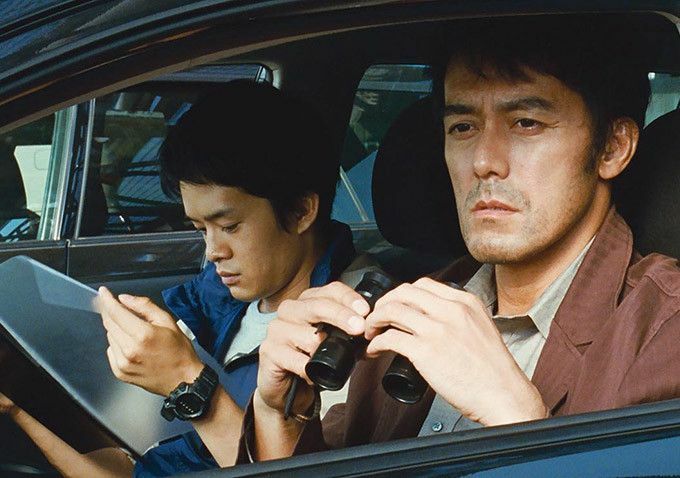 Ryota also spends some of his detective time spying on his ex-wife in order to see whom she is dating at the moment. He is disturbed to discover that she is currently seeing an aggressive and wealthy arriviste who seems to have serious intents about hooking up with Kyoko – the man has beaten Ryota to the punch and purchased an expensive baseball glove that their son Shingo wants to have. Ryota suspects that if Kyoko marries this man, then his once-a-month visitation rights of Shingo will disappear. So on his day-long visit with Shingo, Ryota makes a big effort to establish a vital bond with the boy. He spends the day treating Shingo to things and revisiting his own adolescent mischief-making, which Ryota thinks will make Shingo feel closer to his father. At the end of the day, they go to dine with his mother at her condo, where Kyoko is supposed to come and pick up her son. But just at that time an earlier forecasted strong typhoon sweeps through Tokyo (the 23rd one of the year, we are told). With such vicious weather, everyone will have to spend the night at the Yoshiko’s condo, and this gives Ryota a chance to have separate, private moments with both Kyoko and Shingo. This is the moment we have been waiting for in this slow-paced film. After all, the title suggests that there will be a big change “after the storm”. However, Ryota hasn’t changed or become more enlightened over the course of the film, and the scope of his horizon is still limited by his own selfishness. Everything is told in a slow, easygoing manner, with lots of little local-cultural details about this slice of Japanese society offered along the way. This fits well with the generally good-natured and easygoing natures of all the people on display. 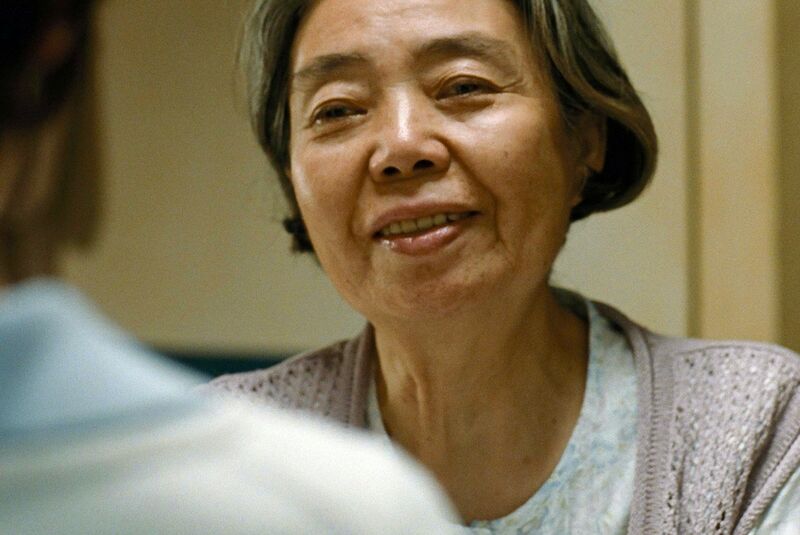 A particularly important secondary character in all of this is Ryota’s mother, Yoshiko. Like Ryota, Yoshiko is cordial and good-natured almost all the time, but she also has a calculative, selfish side, too. 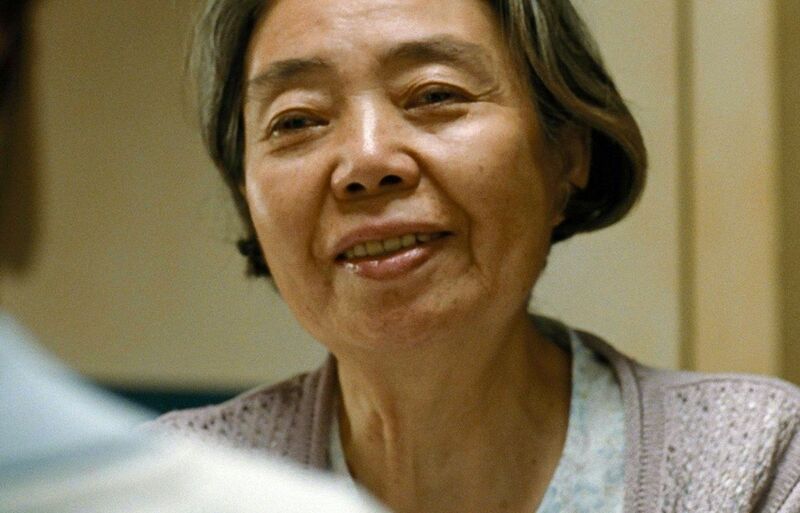 And she shows no sense of sorrow or bereavement over the recent death of her husband (neither does Ryota). True, her husband gambled away all the family’s household money, but Yoshiko’s totally nonchalant and callous attitude about her husband’s passing seems odd to me. In fact I get the impression that the displayed attitudes of Ryota and Yoshiko are intended to be amusing and that we should view After the Storm as a comedy. Ryota is just a perpetually naughty boy, and he is not showing signs of growing up. In fact his son Shingo seems more mature than he is. When Ryota spends the day with Shingo, he seems to want to show Shingo his naughty side. Shingo goes along with it primarily to humor his dad. However, this idea of a comedy is not what comes across from reading the early reviews of the film from the Cannes Film Festival. They mostly praised the film as a genuine slice-of-life depiction of Japanese culture, and they often invoked comparisons to the earlier, and seriously intentioned, work of Mikio Naruse and Yasujiro Ozu. Other than the fact that all these films are concerned with Japanese family relations, I don’t see a strong connection. Ozu’s films, in particular, have more compelling themes to them than After the Storm. In fact this points to the real problem with After the Storm. Although the technical production values are strong and the characters are likeable, there is no real narrative development in this film. What we have is a potentially interesting social fabric that could be the basis for an interesting story, but no such story is forthcoming. At the end of the film, we are pretty much right where we started. Kirin Kiki and Hiroshi Abe also played mother and son in Koreeda’s earlier Still Walking (2008) – but here we are just given a collection of cinematic bits and pieces that dwell on their characters. For a film to be a truly successful experience, one needs more than interesting characters; one needs their participation in an interesting story. This is what Ozu, for one, offered to his viewers.